• 7 Week, 6 Day/Week Training Plan designed for tactical and other high impact athletes ages 45-55 years old. • Plan concurrently trains gym-based heavy strength, chassis integrity, endurance, work capacity and chassis integrity. SF45 Delta is the fourth and final of a series of 4 training plans in this collection – Alpha, Charlie and Bravo are the the other 3 plans in this series. All four plans can be purchased together in a packet, HERE. 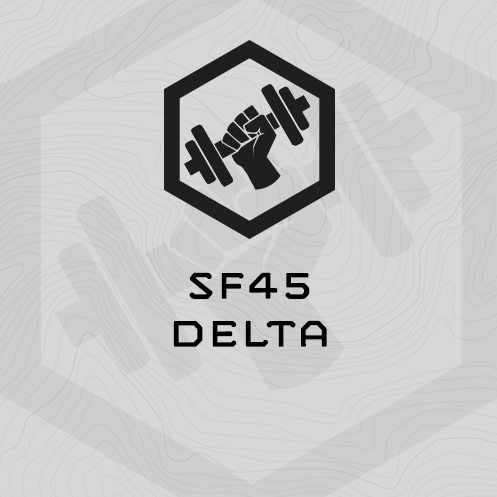 SF45 Delta is a 7-week, 6 day/week training plan with an emphasis on bodyweight strength and general aerobic endurance. Week 7 in the plan is an unload/re-assessment week. This is the first version of this plan, published July 2017. Strength – The Strength Programming in SF45 Delta breaks from Alpha, Bravo and Charlie in that the plan steps away from heavy, low-volume barbell-based strength training to focus exclusively on bodyweight strength training. SF45 Delta deploys three types of bodyweight strength training: Assessment-Based, Volume-Based, and Flow. Assessment-Based: 3x Exercises are assessed for max reps: In-Place Lunges, Hand Release Push Ups and Pull Ups. The follow-on progressions are based on the athletes assessment results, and the exercises are re-assessed mid-cycle, and the progressions reset. Volume-Based: SF45 Delta uses simple volume progression for three exercises on Tuesday: Mini Leg Blasters, Dips and Chin Ups. Flow: Three separated bodyweight “Flow” circuits are deployed this cycle. Each circuit includes upper body pressing exercise(s), pulling exercise (including rope climbs) and lower body exercises. Progression is based on time – you’ll start at 20 minutes and extend to 30 minutes. Chassis Integrity – MTI’s mid-section training methodology aims at building transferable mid-section strength and strength endurance. Four movements are emphasized: Rotation, Anti-Rotation, Total Body and Extension. Chassis Integrity can be trained in focused circuits, as well as in complementary gym-based endurance events. SF45 Delta trains Chassis Integrity 2x/week. Work Capacity – SF45 Delta’s work capacity efforts extend 20+ minutes and are multi-modal gym-based efforts combining a barbell strength movement with step ups, running, or both. 60-120 Minutes. Gym work is designed to take 60-70 minutes. Endurance days will extend to 120 minutes. Fully-equipped functional fitness gym including barbells/dumbells, plates, bumpers, rack, bench, plyo boxes, sandbag (40/60/80 pound). Even though the strength training in SF45 Delta is bodyweight-based, the Chassis Integrity and Work Capacity efforts require equipment. Stop watch with countdown interval timer. Part (1) is a Grind, not for time. Work steadily, not frantically. 30x Step Ups @ 20"
Do 3-4 warm up reps on the Hinge Lift working up to the prescribed weight in this work capacity effort. If this prescribed weight is too heavy for you, easy - drop it by 50 pounds. Be smart. Endurance mode of choice today. It's up to the athlete. Easy = You can speak in full sentences.